No Transistors! No Batteries! No Electricity! What a great catch phrase! 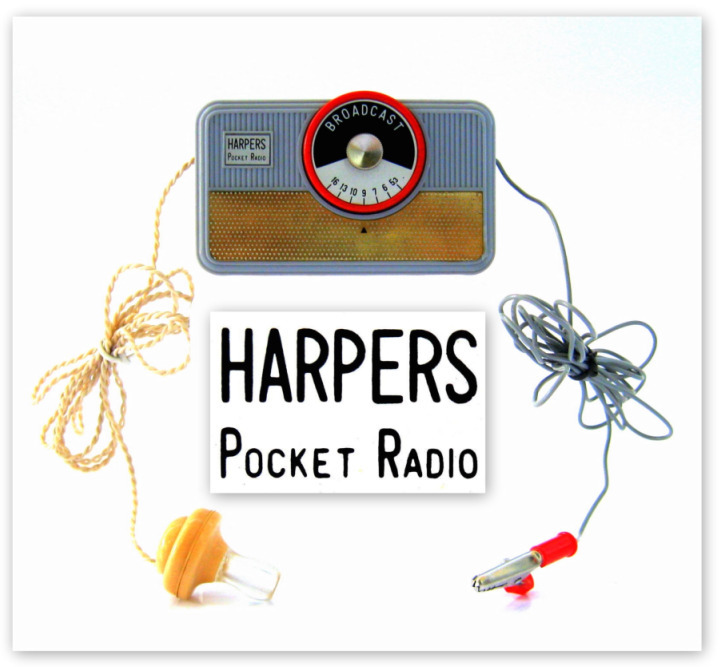 This little Harpers "Pocket Radio" was manufactured in Japan circa 1960. 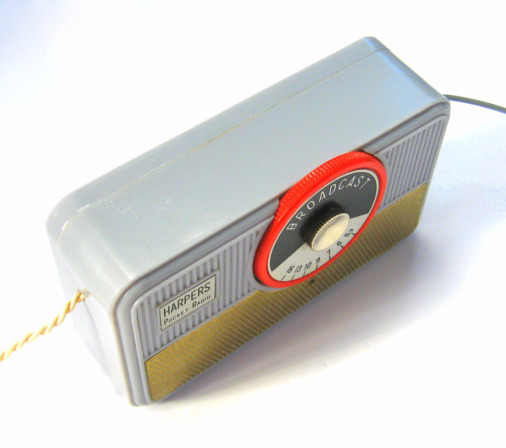 Like all crystal radios it does not use batteries or electricity and there is only one moving part, the tuning dial. 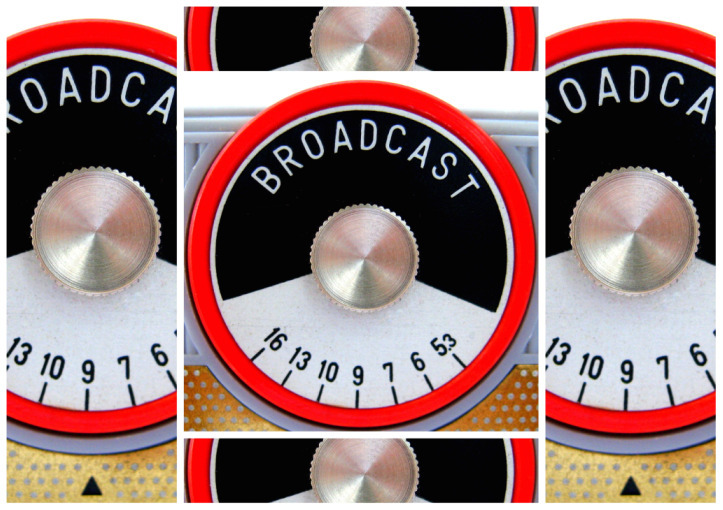 So what is a crystal radio? Essentially it is the distilled essence of a radio receiver. It needs no battery and runs only on the power received from radio waves. It consists of a minimum of components; a antenna to pick up radio waves, a ferrite core coil (inductor) and a capacitor for tuning, a crystal detector (diode) for extracting the audio signal from the radio waves and an earphone to convert the audio signal to sound waves so they can be heard. A crystal set is unamplified and uses radio waves as its only power source. These waves are not powerful enough to drive a speaker but they can be heard through an earphone. Crystal radios, they have been around since what, the 1950's? Actually crystal radios have been around since the early 1900's. 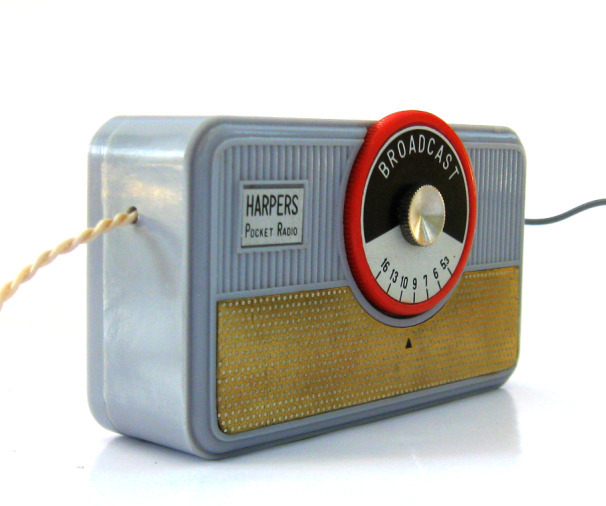 Crystal radio was invented by a long, partly obscure chain of discoveries in the late 1800s that gradually evolved into more and more practical radio receivers. In the early 1900s, various researchers discovered that certain metallic minerals, such as galena (a crystal), could be used to detect radio signals. Researchers also discovered that a fine pointed wire known as a "cat's whisker" in delicate contact with a crystal acts as a semiconductor able to extract audio signals. This setup is known as a crystal detector. The crystal detector required manual adjustment of the cat’s whisker to find a “hot spot” on the crystal that provided the best radio wave detection. In the 1940's the cats whisker gave way to the sealed crystal with fixed wires commonly called a diode. From about 1920 onwards radio receivers made use of newly developed circuits and vacuum tubes that enabled increased volume and tuning sensitivity. This led to a decrease in the popularity of Crystal sets. However, they were still popular amongst children and hobbyists due to their simplicity and low cost. 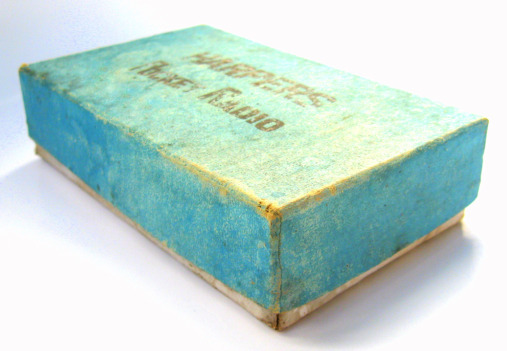 Crystal sets continued to be developed through the 1930's and 1940's and were often marketed in cute cases that took the form of miniature mantle radios. These tiny crystal radios were advertised in hobbyist magazines as 'pocket radios'. 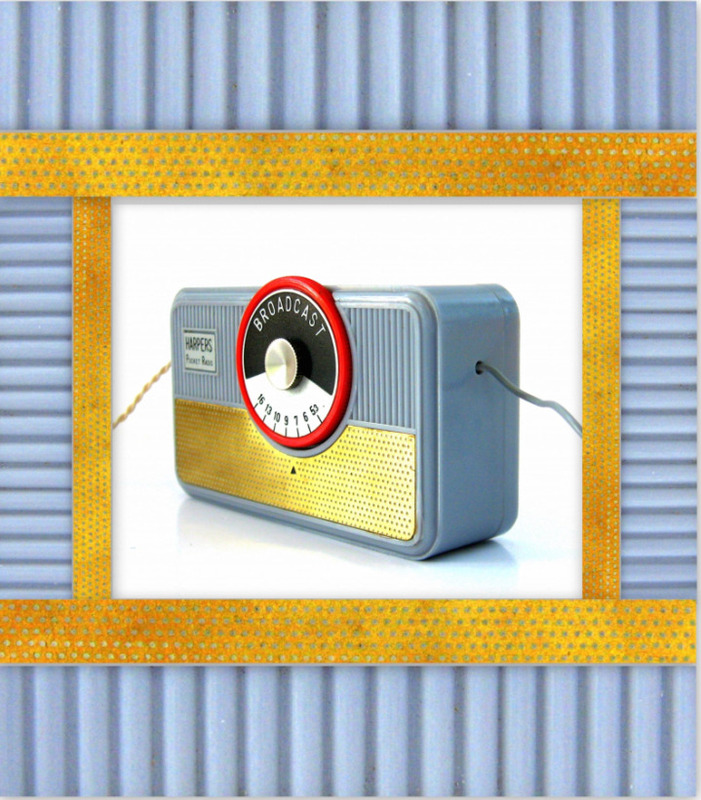 Crystal radios were further developed throughout the 1940's and 1950's taking the form of, and likely influencing the look of later shirt pocket transistor radios. For more on the development of crystal radios during this time period see my Tinytone Crystal Radio listing. 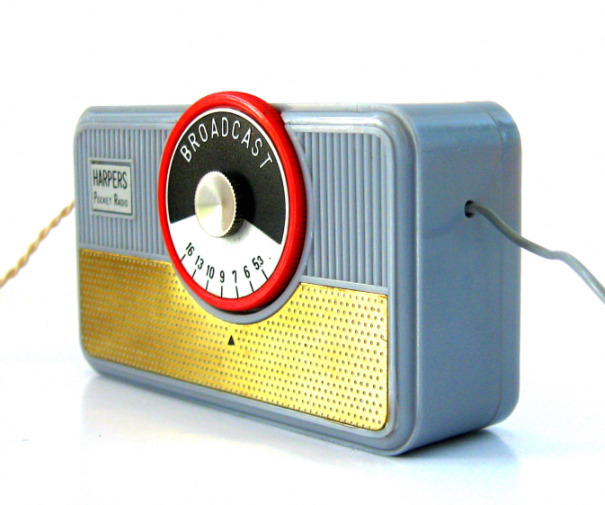 For a list of crystal radio advertisements through the ages click here. A Vest Pocket Size Radio! Smaller Than A King Size Pack Of Cigarettes! 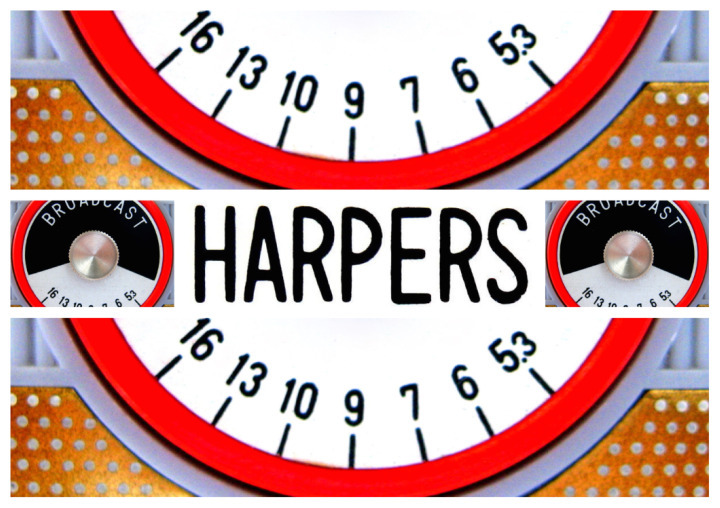 This Harpers Crystal Radio has a bold red and black tuning dial with 'Broadcast' printed on it. 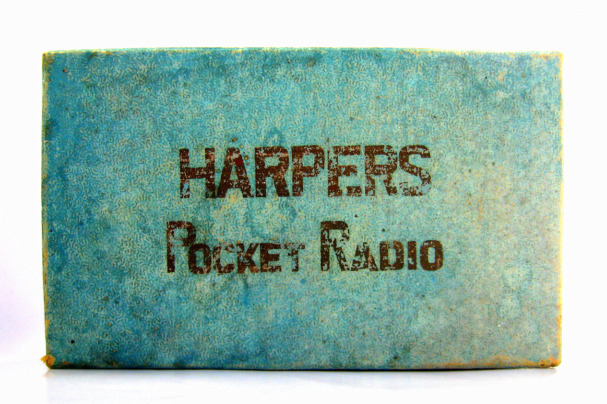 It has a small badge on the front that reads 'Harpers Pocket Radio'. 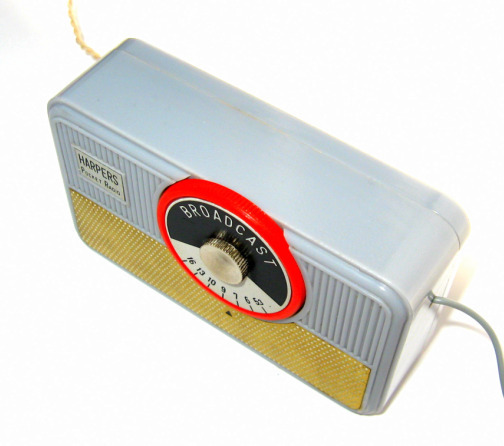 A common feature of crystal radios of this type and period is their use of fake speaker grills designed to give the impression that they have a speaker! This one has a nice gold, perforated metal grill but they can also be found with plastic speaker grills, foil grills and even with metallic speaker grill cloth glued directly to the front. The blue/gray cabinet has vertical corrugated grills on the front. 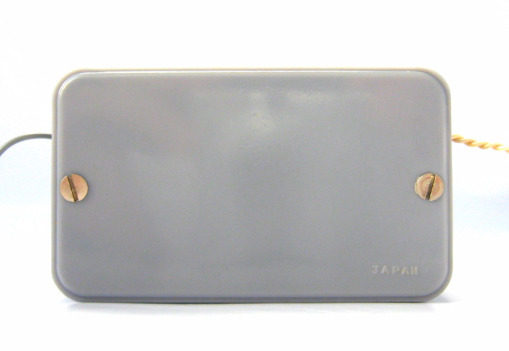 'Japan' is stamped on he back and the back is attached to the front with two screws. I have seen this radio branded as Arrow, Lucky, & Pet. I've also seen slight variations of this radio branded as Kent, Arrow & Lloyds with squarer corners. 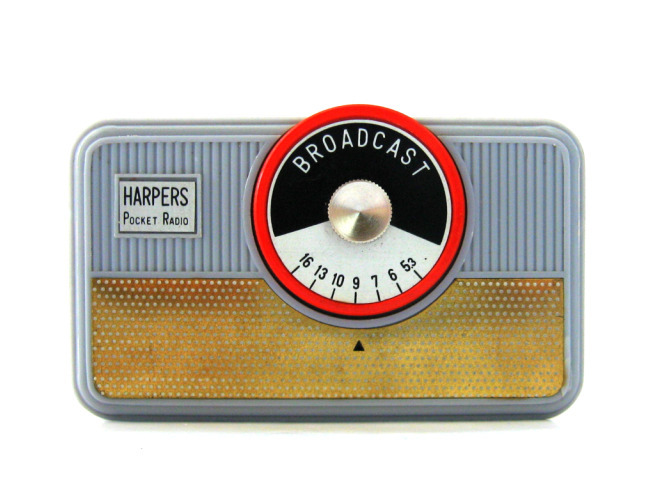 Some have vertical corrugated grills such as that displayed on this radios blue cabinet and others have horizontal grills. I have also seen some vertical variations that look like this radio standing on its side. 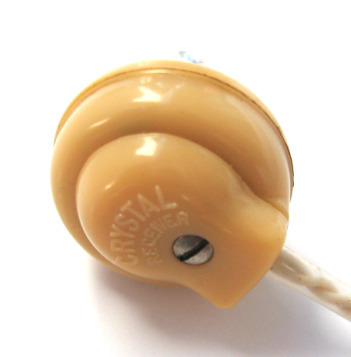 The earphone is stamped 'Crystal Receiver'. 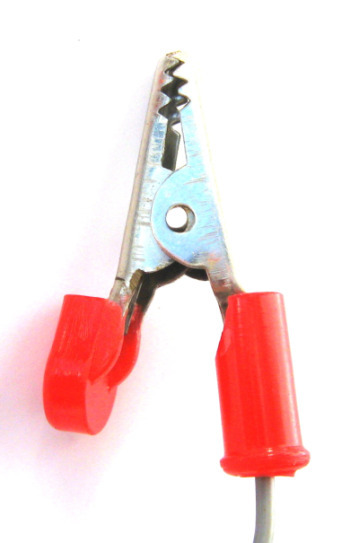 The alligator clip for attaching to a suitable 'antenna' like a bed spring, the fins of a oil heater or a drainpipe etc. Works Even When Power Failure Makes Other Radios Go Dead! Looking inside, there really isn't much to it! 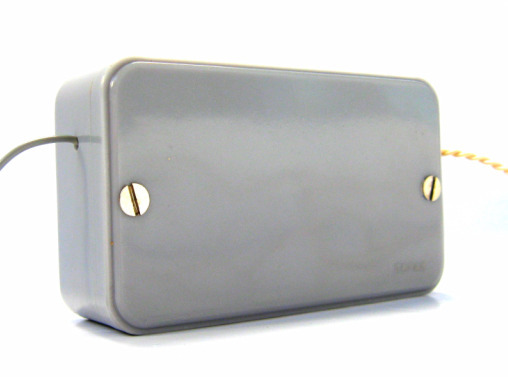 The tuner runs up and down a groove cut into the ferrite coil bringing in stations across the am band. 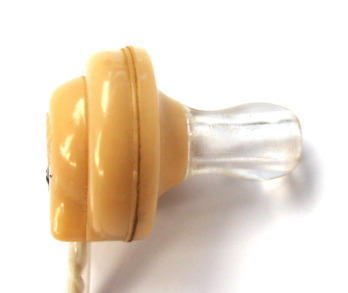 The magic crystal diode is colored yellow and the capacitor is brown. There is plenty of room left inside the cabinet and I've seen these radios turned into transistor receivers with the addition of a few extra parts.